One of those trilogies to reread ... definitely ... would like to have traveled through the country described. Did hitch-hike North Island in 1968. Couldn't get to South Island, then, due to a ferry strike.First read Shadbolt's non-fiction, about islands in the Pacific. 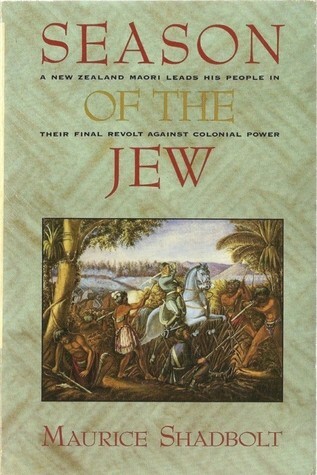 In "Season," he showed me an era of New Zealand history that is reflected in the following copied L A Times review :"'The Season of the Jew' is a novel about the war between the English settlers in New Zealand and a band of Maori tribesmen who rebelled in the 1860s against the growing colonial occupation of their lands.In form, it is a superior, though rather clogged, example of the historical fiction genre. What gives it a special quality is that it possesses a passion as well as a story. The passion is the author's quarrel with history or, at least, with historical fashions.It is not, of course, an American reader's quarrel. And yet there is a benefit in it. It provides energy to a story that might otherwise seem remote and overdetailed.Maurice Shadbolt, the author, makes it clear throughout and particularly in a series of notes at the end that he rejects the version of history that proclaimed the English in New Zealand to be the benevolent bearers of civilization. But he also rejects more recent versions that stress the virtues of Maori resistance and understate the cruelty that went with it. Historical judgment, as he puts it in the mouth of his protagonist toward the end of the book, is simply an argument over "whose arse is blacker." This book should be cliched but isn't. The main character is a British soldier disillusioned with the empire and its treatment of the native people of New Zealand, and a reluctant hero. Every comment he makes is a sarcastic attack on the colonials and the empire. From this description you would think you've read this a hundred times before, but you'd be wrong. Through sheer brilliance of writing, it works, and you feel as if this is how it should have been done all along.The plot fizzed out a little toward the end, I thought, which is why I have to give it four stars instead of five. But this is a book you read for the style, and for that it is well worth it. This book is surprisingly little known, for its quality. Especially since the topic it covers - New Zealand and the Maori-Colonialist conflict - is not covered by heaps of other authors.I got the recommendation for it from the website of the author Mary Doria Russell, and I can certainly see why she would enjoy that book. There is in it a certain type of incredibly witty dialogue that manages to get in large amounts of sarcasm in a single sentence that reminds me of her books, as well as the kind of underhanded cleverness you see in Terry Pratchett's dialogue. The story itself follows Te Kooti, the Maori merchant who, due to various misdeeds and offenses of the colonialists, turns fanatic, and Captain (initially Lieutenant) Fairweather, who begins the book as a disillusioned soldier,decommissioned because of "excessive humanitarianism", and ends it as... not all that different from Kooti himself.The best parts of the book are the dialogue, which can carry an amazing amount of subtext, high quality of writing, and a level of moral uncertainty that pulls the book from cliche or "political absolution for colonialism" to something much better. Maurice Shadbolt is (or was) a great writer, far less well known outside his native New Zealand than he deserves. His especial forte are novels set in the era of early settlement and the Maori wars of NZ. Season of the Jew is, in my view, his masterwork, a beautifully crafted tale of a damaged, world-weary somewhat drunken ex-Army officer - George Fairweather - and the spellbinding and erudite Maori Messiah he meets, Te Kooti, who then goes on to lead the most effective Maori uprising of the conflict, in the remote fastnesses of the Urewera mountains. The title of the book is drawn from the Old Testament imagery which Te Kooti invoked to attract supporters to him, likening them to the Biblical Israelites in the wilderness. The story focusses around the corrupt and struggling colony at aptly-named Poverty Bay and how Fairweather, despite a deep affection and respect for the Maori people, is forced against his will into conflict with Te Kooti, and ultimately himself is destroyed in attempting to defend a young Maori rebel from the brutal hand of colonial justice. In its lyrical depiction of the wild New Zealand forests, its haunting love story and its beautifully delineated characters, this is a great book by any measure. It evokes a series of classics from Last of the Mohicans to Breaker Morant in its cry against the repression and rough justice of European colonialism, but does so better, for my money. Well worth reading, especially if you know little about NZ's fascinating history. Great read, humourous in places. Shadbolt is a natural storyteller. Fascinating in parts - great to learn about Poverty Bay and Te Kooti. I did struggle to deal with the semi-fictional nature of the book. While I want to understand everything about Te Kooti and the colonists, at times I realised the story had slipped into pure fiction and i became disheartened. Fortunately Shadbolt writes beautifully so it is pleasant reading when the author develops characters and explores relationships. I just found at these times I yearned for the true historical facts, in particular I became fascinated with Maori spiritualism and culture. My all time favourite of Shadbolt's series of historical novels. This is a real eye opener in more ways than one. It sheds light on both Maori tribal structure and how the armed forces operated in early New Zealand. This is one of the sadist stories I have ever read but don't let that put you off, there is a certain joy in knowing Hamiora's story was told. A really interesting take on Te Kooti's War in 1868-69 New Zealand. The bulk of the novel consists of dialogue which can drag a little bit at times, but the central character, George Fairweather, is compellingly drawn: a cynical wit who gets dragged into a cycle of revenge against his better judgement. Most of the characters are based on real historical figures. At the time, in the 1980s, there hadn't been a definitive historical account of Te Kooti. I'm keen to read Judith Binney's book on him published din the 1990s now. Just some comments. It's a long time since I read this (1990) so I'm going by what I said at the time in a diary. Shadbolt rather curiously has the usual rider at the beginning of the book to the effect that none of the characters or situations are based on real life people, and then finishes the book with a section entitled Face and Further, which goes on to say how the main characters fared after the end of the book. Most of them were real historical personages, and did most of what Shadbolt has them do, given that he dresses it up in a fictional form. The main character, Fairweather, is rather off-putting. Though you understand his compassion, and his later desire for revenge on Te Kooti, you often feel at a distance from him. He speaks in an epigrammatic style, almost constantly, and often you have to go back again and re-read what he said to understand it: it's so succinctly said. A large number of the conversations are in this style ˗ Fairweather isn't the only one given to this approach. It has the effect of making the people not quite alive. Their talk is often too clever by half. The writing overall, however, is superb: the characterisation of the land is most evocative and of war, gripping. Shadbolt often uses short sharp words to great effect: a lesson to any writer wanting to get an onomatopoeic effect without using words that are unusual. Good, blunt English words. Thanks, Vicki, for passing this one on. I found it challenging because I try not to read war books and history books, but actually was glad I read it. Enlightenment on that part of NZ history. Te Kooti, banished to the Chatham Islands in 1860s, sees his people as like the Israelites of the Old Testament. He steals a ship, returns to Poverty Bay, and carries out a series of massacres. George Fairweather, late of the British Imperial Army, and now a lowly painter/traveller, finds himself embroiled in the conflict.Shadbolt takes special care in his descriptions of landscapes and weather - by contrast, physical description of characters are rare. The text is enjoyably dialogue heavy, the dialogue itself spare yet elaborate - arguably rather unrealistic but rich and occasionally funny.He is not shy is describing the atroctites carried out by Maori (and not just Kooti's), nor is he at all complimentary about the colonial government. Perhaps Shadbolt is wondering at how a relatively good nation was born out of such inauspcious beginnings.Grim, contemplative, yet also funny and action packed - a page turner. Ok well first off, my dad gave me this novel so OF COURSE I am going to like it. The book is a real page-turner historical fiction about the NZ Maori wars. It is beautifully written, although somethings were lost on me due to my lack of complete military knowledge when it comes to maneuvers and such. The broad themes in the book (justice, humanity, war, vengeance) are very well done. The main character is a little too perfect for my liking, but I guess he has a flaw that is integral to the book. The sarcasm in the book is pretty funny, and I was often reading it an flashing a bit of a smile. The dry humor was a very good contrast to the carnage. Anyways, a good read. It's 3.5 to 4.0. The story is one most NZers know but there are many details and less well known aspects of the story here.At times the writing is dense and the dialogue overly mannered. I lost my way in the sections about the fighting and some characters are insufficiently drawn.I like Fairweather but never felt close to him. And I never really got to know Meriana.Aspects of the story are heartbreaking and alarming but it's a background to the way things have been and still are in some respects in New Zealand.I was more involved in the end of the story than the middle. wonderful book. kept me enthralled and gave me an appreciation for the incredibly higly evolved warfare of the Maori in early NZ and the interactions and relationships between tribes. nicely constructed... really wonderful. Wonderful read! Shadbolt has an amazing handle on the English language. His ability to turn a phrase to express irony, sarcasm and emotion is a genuine delight. Well developed characters and moments where a good chuckle can change to horror of man's nature. I was looking forward to continuing my NZ historical journey with this novel. But what a disappointment, it is written like a 11 year old would, all spoken sentance, no substance.I gave up on page 47, with no end in sight of the narrative improving. Worth pushing through to the end. Still a very colonial perspective on the Maori wars. It left me feeling very conflicted and not really that enlightened. But does give a background to the history of the Gisborne and Utuweras. This book is about the end of the Maori Wars around l869. There were Maori fighting on both sides which led to some terrible dilemmas. An inspiring book, bringing early New Zealand to life. I read this a few years back, and still remember sections of it. Maurice Shadbolt - Maurice Shadbolt was a major New Zealand fiction writer and playwright. He published numerous novels and collections of short fiction, as well as novellas, non-fiction, and a play. His writing often drew on his own family history. Shadbolt won several fellowships and almost every major literary prize, some more than once. He was capped Honorary Doctor of Literature by the University of Auckland in 1997.